I’ve written many times about the importance of educational technology, the tools that can differentiate for students, engage them, and provide data for teachers. However, it’s not imperative that a teacher be an expert in #edtech. Like our students, there’s a range of abilities and circumstances. Also like our students, what makes the biggest difference is the approach, the attitude, the willingness to learn. And I have to say, teachers are oftentimes the worst learners. 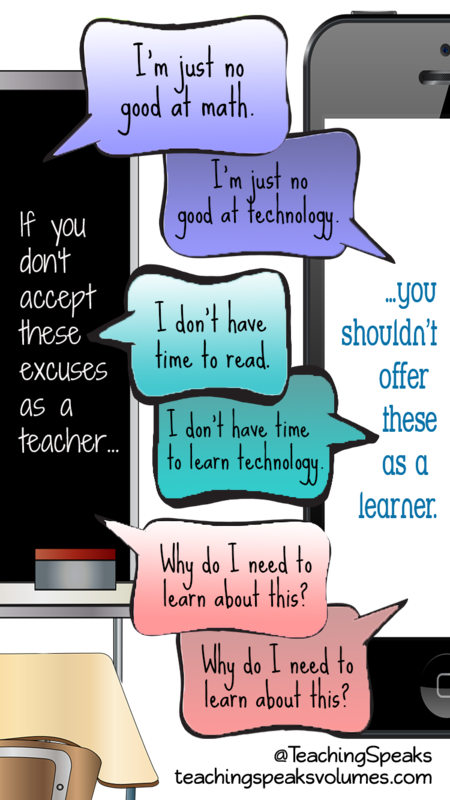 It amazes me when teachers offer up excuses they would never allow a student to give them. We are months away from 2016. Being a tech expert is not required, but ignoring educational technology is no longer an option. It’s in the standards. It’s part of your job. If you wouldn’t allow the excuse, don’t offer it as your own.